On August 2, 1993 , a group led by Tai Situ and Goshir Gyaltsab Rinpoches forcibly took over Rumtek Mona stery in Sikkim , the seat of Gyalwa Karmapa, with the help of police provided by the state government of Sikkim.Ever since, possession of Rumtek has been a key issue in the Karmapa controversy. In her book, Lea Terhune talks in glowing terms about the help that Situ and Gyaltsab Rinpoches received from the government of Sikkim under Chief Minister Nar Bahadur Bhandari in gaining control of Rumtek. “Bhandari was a controversial figure in Sikkim,” Terhune admits, “often criticized for corruption.” But then she goes on to praise the then chief minister’s actions: “However, he respected the Sixteenth Karmapa and frequently assisted Rumtek Mona stery [under Situ and Gyaltsab Rinpoches] while he was in power.” (p. 193)Terhune’s discussion raises many questions. Did Situ and Gyaltsab Rinpoches have the right to take control of Rumtek? Why would Chief Minister Bhandari help them do so, even when it meant violating the well known prohibition enshrined in India ‘s constitution against government interference in religion? How did Situ and Gyaltsab Rinpoches convince the chief minister to assist them? Why were they so eager to take Rumtek, in whose administration they traditionally had no role? And why are they so eager to keep it now?We will answer these questions here and also talk about the response of the Karmapa Charitable Trust. The Trust filed a court case for the return of Rumtek that has been successful in both District and High Courts. Now, the verdicts favorable to the Trust face one final challenge in the form of an appeal by the group of Situ and Gyaltsab Rinpoches in the Supreme Court. The first case was filed a full five years after the seizure of Rumtek. We will discuss here why the political climate in Sikkim prevented it from being filed earlier.What Rights Did Situ and Gyaltsab Rinpoches Have Over Rumtek? To answer this question, it is necessary to understand something about the legal structure of Tibetan monastic administrations. Traditionally, each high lama has his or her own labrang , or administration, to govern the monasteries and other properties under his control. The Karmapas have had their own labrang which has always been separate from the labrangs of other high lamas. Situ Rinpoche led the Palpung Labrang while Gyaltsab led his own Chogong Labrang, named respectively after each rinpoche’s traditional monastic seat. 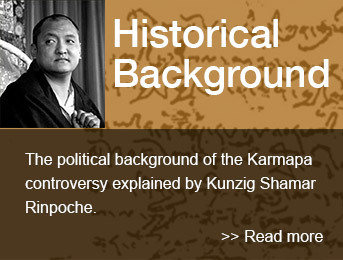 Under the Tibetan system, lamas from one labrang had no administrative authority in another administration. Thus, the two rinpoches, Situ and Gyaltsab, would never have been able to legally gain control of Rumtek Mona stery, which was part of the Karmapa Labrang rather than part of either of their own administrations. So the only way open to lamas to take property from an outside labrang would be, simply put, to conduct a kind of coup d’état there. They found a powerful ally in the Sikkim state government of NB Bhandari. Throughout Sikkim , stories of those bold enough to risk Bhandari’s wrath during this period abound. First, there was the opposition leader, Madan Tamang, who dared to circulate pamphlets accusing Bhandari of corruption and womanizing. In response, Mandan was arrested and died in custody. His body was later found in bushes alongside the Rongpo River . Shortly after this, a reporter in Siliguri, RK Baid, published a story detailing some recent examples of corruption in Bhandari’s administration. After this, Bhandari sent undercover police into the neighboring state of West Bengal —outside of their legal jurisdiction—to kidnap Baid and bring him to Gangtok. There he was held in prison and tortured. Afterwards, he was offered an amount of money said to be as high as five million rupees to sign a statement denying that he was kidnapped or mistreated. This reporter later opened a hotel in Siliguri using this hush money. Finally, Hamelal Bhandari (no relation to the chief minister), an attorney in Gangtok, took it upon himself to circulate posters again criticizing the chief minister’s actions. In responses, he was abducted by party bullies, taken to prison, tortured, and then thrown naked off a truck the next day onto the main street of Gangtok. He was lucky to escape with his life. What Was the Basis of the Case Filed by the Trust? Meanwhile, in early 1996, Shamar Rinpoche convened a meeting of the Karmapa Charitable Trust trustees at the Sinclair Hotel in Siliguri. He requested permission from the other trustees to file a case on their behalf, since they were all either elderly or had ailing relatives to attend to. The other trustees agreed and gave Shamar Rinpoche authority to file a case. Accordingly, on July 27, 1997 working on behalf of the Karmapa Trust, Shamar Rinpoche filed a case in Gangtok District Court accusing Situ and Gyaltsab Rinpoches of unlawfully seizing Rumtek from the administration of the Trust. In the case, the Sikkim state minister of home affairs was defendant #1, the Sikkim minister of religious affairs was defendant #2 and Gyaltsab Rinpoche was listed as defendant #3, since Situ Rinpoche had already been expelled from India for his suspicious dealings with China. It took several years for the court to agree to hear the case because of preliminary issues raised by Gyaltsab Rinpoche’s lawyer: First, that the Karmapa Trust, with assets of only 200,000 Indian Rupees, did not have sufficient resources to maintain the land and facilities of Rumtek; And second, that since the events referred to in the filing took place in 1993, four years earlier, that the statute of limitations had expired to file a case. Finally, at the end of 2002, the Karmapa Charitable Trust answered all of these preliminary issues and the case could proceed. The court appointed a commission of the Reserve Bank of India to conduct an inventory of the assets on site at Rumtek. What was Gyaltsab Rinpoche Afraid Of? Conducting a proper inventory of the moveable assets at Rumtek meant that some treasures might be discovered missing. Apparently this made Gyaltsab Rinpoche nervous, and perhaps he was afraid that a criminal charge would be filed against him if anything was found missing. Therefore he submitted a new application to the court, asking that he be excused from the case, claiming that he had no rights to manage Rumtek and that he was part of a separate Labrang , or monastic administration, from Karmapa. In an attempt to shift the blame away from himself, at this time Gyaltsab Rinpoche created a new entity, which he called the “Tsurphu Labrang.” Gyaltsab Rinpoche hoped that this invented entity would stand in as administrator of Rumtek for the purposes of the case. The new pseudo-group was headed by Tenzin Namgyal, listed as general secretary of the Karmapa. When the case was heard, it became clear that this group had no documentation to prove its stewardship of Rumtek, while the Karmapa Charitable Trust could produce minutes of meetings dating back to 1983 concerning its administration of the monastery after the death of the 16 th Karmapa. Accordingly, the District Court decided that the group had no standing as administrator of Rumtek and that the monastery was the property of the Karmapa Trust. Nonetheless, Situ and Gyaltsab Rinpoches and Tenzin Namgyal appealed this decision in the name of this same empty group to the High Court in Gangtok. The High Court denied the appeal in a decision made on March 19, 2003 . So that meant that Gyaltsab Rinpoche could not escape being a defendant in the case. After Losing in Court Twice, Did Situ and Gyaltsab Rinpoches Try to Settle? Since the original commission of the Reserve Bank of India was unable to finish its work, a new inventory of Rumtek’s assets should be conducted to ascertain whether the Vajra Crown was present at Rumtek. Gyaltsab Rinpoche should account for any missing assets, whether transferred to another location or sold, to avoid criminal prosecution. With the exception of 14 lamas who were legitimate residents of Rumtek, though they did collaborate with Situ and Gyaltsab Rinpoches’ seizure of the monastery, all lamas and monks should vacate the premises. Each legitimate monk who had been wrongfully evicted from Rumtek should be paid 50 rupees compensation for every day of the last 11 years that they had to live in other accommodation. Gyaltsab Rinpoche would have to cover all legal costs incurred by the Karmapa Charitable Trust. Gyaltsab and Situ Rinpoche and their monks should not interfere in Rumtek’s affairs or try to return to Rumtek at any point in the future, recognizing that they come from a separate labrang and have no standing at Rumtek. Situ and Gyaltsab Rinpoches would have to make a public apology for all the violence and trouble they had caused at Rumtek and all the allegations they had made against the trustees. Gyaltsab Rinpoche was ready to accept all except points 4 and 5, those concerning financial compensation for the expelled monks and the Karmapa Trust respectively. However, just before Gyaltsab Rinpoche was able to accept the remainder of Shamar Rinpoche’s terms, Situ Rinpoche summoned him to New Delhi . There, Situ Rinpoche convinced Gyaltsab that Shamar Rinpoche’s terms would be just as bad for their cause as losing a third time in court, and therefore, that they had nothing to risk by mounting a final appeal. Thus, Situ and Gyaltsab Rinpoche’s invented group, the Tsurphu Labrang, took its appeal to the Supreme Court in New Delhi . That is where the case rests now, and a decision is expected in July. Why Do Situ and Gyaltsab Rinpoches Still Fight On? Why do Situ and Gyaltsab Rinpoches want to hold onto Rumtek so badly? For two reasons, we believe. First, Gyaltsab Rinpoche knows that Situ Rinpoche has removed several valuable relics from the Rumtek treasury. That these objects have gone missing was demonstrated by the inventory conducted by the Reserve Bank of India . We believe that Gyaltsab Rinpoche is afraid that if his party loses control of Rumtek, then the thefts will be discovered and he will be blamed, opening him up to criminal charges. Second, both rinpoches know that in the minds of Himalayan believers, whoever sits on the Sixteenth Karmapa’s throne and wears the Vajra Crown is the Karmapa. They do not want Thaye Dorje to enjoy these privileges, as this would significantly diminish popular faith in their candidate Orgyen Trinley. So indeed, the stakes in this case are very large. And the outcome does not look good for Situ and Gyaltsab’s cause. With two losses to their record, and no new arguments to present in their final appeal, July’s outcome could bring them bad news. Perhaps that is why Situ and Gyaltsab Rinpoches have launched a misinformation campaign to confuse their followers about the progress of the court cases and prevent them from losing hope. We will discuss this in our next letter.